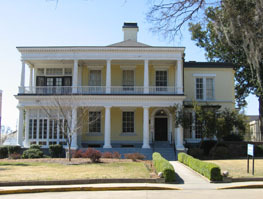 The Stephen Vincent Benét House, also known as the Commandant’s House and the President’s Home, is located on the present campus of Augusta State University. Completed by 1829, the Commandant’s House was one of the original buildings erected as a part of the United States Arsenal when it moved to this site in 1827. Assigned as Commandant of the United States Arsenal in Summerville in 1911, Colonel J. Walker Benét brought his son Stephen with him, enrolling him in the Summerville Academy. They remained in residence at the arsenal until the autumn of 1915. Colonel Walker’s son, Stephen Vincent Benét (1898-1943), became famous for his poetry and prose fiction. Young Benét began writing while living at the arsenal, including his first book, Five Men and Pompey (1915), a series of dramatic monologues in verse. It prefigured the technique he used in his most famous work, John Brown’s Body (1928). Entering Yale University in the fall of 1915, he continued to write and had his first two books published while he was there. Some of his other notable early works include Young Adventure (1918), and The Beginning of Wisdom (1921). Benét received the honor of a Guggenheim Fellowship in 1926, which enabled him to go to Paris to write John Brown’s Body, for which he won the Pulitzer Prize in 1929. In 1937 he published a short story, “The Devil and Daniel Webster,” considered a classic of American literature and made into both an opera and a film. He received a second Pulitzer Prize in 1943 for an uncompleted long poem entitled Western Star. The Commandant’s House at the Augusta Arsenal is the extant building most significantly associated with the career of Stephen Vincent Benét. The 2-story building is of load-bearing brick in the Federal style with a side-hall plan and a full basement. The 3-bay façade is sheltered by a 2-tier portico with Tuscan columns. It features the characteristic Federal fanlight over the front door. The house evolved in the 19th century, with the addition of a 2-story north wing and a small glassed-in chamber to the north side of the entrance hall. Part of a complex that forms a quadrangle, the house was one of several buildings originally constructed by the Federal Government in 1819 near the Savannah River in the village of Harrisburg. After the commandant of the arsenal recovered from malaria at Bellevue, the home of Freeman Walker in the village of Summerville, he persuaded government officials to relocate the facility there on higher, healthier ground. Beginning in 1827, all the original buildings were dismantled and rebuilt in the Summerville Historic District. The Commandant’s House, as originally constructed, was identical (in reverse) to the Officers’ Quarters on the northeast corner of the quadrangle. A brick wall, creating in effect a small fort, encloses the quadrangle. The Department of the Army deactivated the arsenal in 1955. The Richmond County Board of Education acquired it, and it later was home to the Junior College of Augusta. In 1958 the junior college became a part of the University System of Georgia evolving into a four year institution renamed Augusta College in 1963. Augusta College became Augusta State University in 1996. Stephen Vincent Benét House, a National Historic Landmark, is located at 2500 Walton Way on the campus of Augusta State University. Click here for the National Historic Landmark registration file: text and photos. The house currently houses the Admissions Offices for Augusta State University and is open on a limited basis for public tours. Contact Augusta State University Admissions Office at 706-737-1632. The U.S. Arsenal has been documented by the National Park Service’s Historic American Buildings Survey.